The Numbers program has been in existence since the early 90`s. The owner is Dan Meyers from Boston. 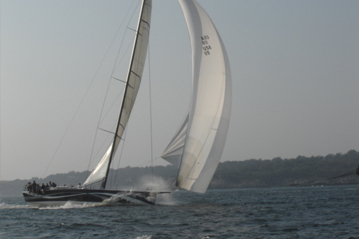 A new 65 footer from Rolf Vrolijk and built at Eric Goetz`s shop in Bristol RI will be launched in Sep/Oct `07. The project manager for the build is John Barnitt, who sailed on Stars and Stripes in Fremantle and Alinghi in New Zealand. They will be campaigning the boat next year at Cork Week. The picture directly below is the new Numbers sea trailing off Newport, RI in October 2007. Several of the crew from Team Alinghi have been regulars on board Numbers since the late nineties. Dan has recently launched at Royal Huisman the 170ft Schooner “Meteor”, designed by Gerard Dykstra. The Meteor will be attending all the events as their mothership. The secret of Cork Week’s success cannot be attributed to any one rule or aspect of it’s organisation. It’s success is found in the eclectic mix of classes, competitors, good courses, good company, our team of dedicated volunteers and the good humour of our 10,000 visitors.